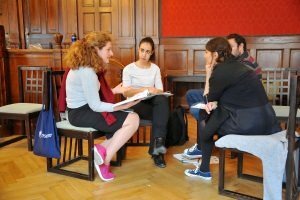 Yesod is a collaborative initiative dedicated to strengthening the future of Jewish Europe by investing in key individual Jewish community professionals, educators and activists. Yesod offers professional development and Jewish fluency (knowledge, understanding, questioning and application) opportunities including seminars, funding and online resources. For more information see here. Kaplan Fellows @Yesod is one of our flagship programmes. What is the Kaplan Leadership Initiative? The Kaplan Leadership Initiative is an international professional development programme that equips young Jewish professional leaders from the Former Soviet Union, Europe and Latin America with the knowledge, skills and support they need to build, strengthen and grow their own Jewish communities. The Kaplan Leadership Initiative was launched to give talented and promising Jewish professional leaders the tools they need to march their communities into the future. Each Kaplan Leadership Initiative cohort consists of regional programmes, run in the Former Soviet Union, Europe and Latin America. 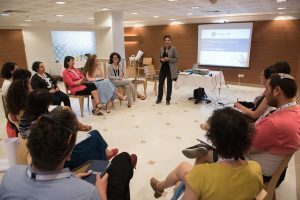 Each regional programme includes three regional gatherings, each focusing on a major theme in leadership while integrating Jewish content and exploring the vibrant Jewish life of each region. In addition, all regional groups gather for a week-long seminar at the Spertus Institute for Jewish Learning and Leadership in Chicago, United States, where fellows will network, share experiences and strengthen global Jewish leadership identity. Who are the Kaplan Fellows @Yesod? The European Kaplan Fellows are a select group of 16 talented and motivated Jewish community professionals. We deliberately choose participants from different countries, with different backgrounds and experiences, and we ask everyone to bring themselves fully to the experience. Kaplan Fellows @Yesod is funded by the Kaplan Leadership Initiative. All meals during seminars. All food is supervised kosher. In addition we believe that participants should demonstrate commitment with some meaningful financial contribution. Therefore, European participants (or their organizations) are asked to pay a total of 400 Euros, reflecting 100 euros per seminar. A stronger commitment to being a Jewish community professional; an understanding of why this work is valuable and how you can contribute. Practical skills, such as presentation and communication skills; tools to map your community and develop a vision for the future; methods to build relationships and motivate teams; ideas for how to incorporate Jewish values into programmes; tools to assess and evaluate success; methods for failing forward and more. An understanding of different approaches to leadership, how you can contribute your own acts of leadership and what it means to envision and catalyze change in your community. Greater understanding of your own strengths, challenges and areas of growth. A strong network of peers in varied Jewish communities who provide each other mutual support, sharing of knowledge and possibilities for future collaboration. If I am a Jewish community activist but don’t have a full-time job, can I apply? Unfortunately, no. The Kaplan Fellows @Yesod is designed for full-time Jewish community professionals. If my English is not fluent, can I participate? The programme is conducted wholly in English and requires a good level of understanding and communication. As part of the application process we will assess your level of English. How can I convince my boss that I should do this programme? We know this programme of professional development will not only benefit you personally, but also your organization. We want to help you make the case to your supervisors that it is time well spent and it is in their interest to support your application. See the question above about what you will get out of the programme, and use it to explain to your boss that your time in this programme will be worthwhile. We are happy to help you with this – just ask! If you think you belong in the next cohort of Kaplan Fellows @Yesod, please check the dates, ensure that you have support from your supervisor, arrange for two recommendations and click here.